You’ll be joining a dedicated team of people making a difference to the lives of thousands of people in Northern Ireland. 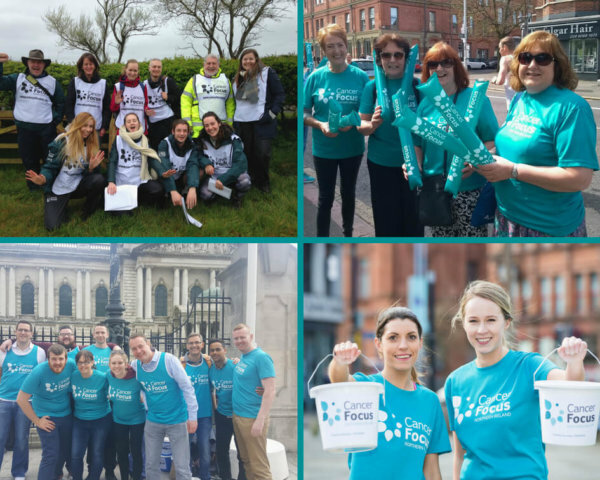 Here at Cancer Focus NI we are supported by an amazing team of volunteers who work away behind the scenes and give us their time, experience and expertise to help local people and communities affected by cancer. Anyone can volunteer with us – students, people between jobs who want to broaden their skills, retired people who have a wealth of life skills to offer, and everyone in between. The most important requirements are enthusiasm, a desire to support our work and some free time. How much time do I need to offer? It’s up to you and depends on what you would like to do. Many of our volunteering roles are flexible and we’re happy to discuss with you how much you want to be involved. Then join us at any of our street collections or bag packs. Cancer Focus NI is dependent on public donations so every £1 collected helps maintain our vital care services and education services. £15 pays for someone affected by cancer to attend a creative therapy session. £25 pays for a counselling session. £100 pays for 6 weeks support for a bereaved child. You can make a positive difference to a family affected by cancer with just a few hours of your time. 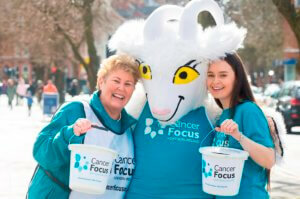 For more information, please contact Morag Chambers on 028 9066 3281 or email moragchambers@cancerfocusni.org. Alternatively fill in the below enquiry form and we’ll be in touch with you shortly.